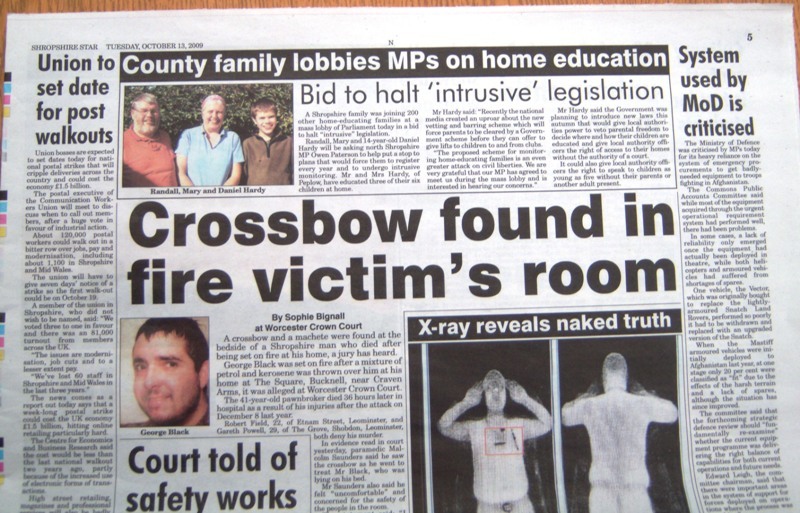 A few days after returning from the mass lobby of Parliament we were told this story had been in the Shropshire Star. A Shropshire family was joining 200 other home-educating families at a mass lobby of Parliament today in a bid to halt “intrusive” legislation. Randall, Mary and 14-year-old Daniel Hardy will be asking north Shropshire MP Owen Paterson to help put a stop to plans that would force them to register every year and to undergo intrusive monitoring. Mr and Mrs Hardy, of Peplow, have educated three of their six children at home. Mr Hardy said: “Recently the national media created an uproar about the new vetting and barring scheme which will force parents to be cleared by a Government scheme before they can offer to give lifts to children to and from clubs. Mr Hardy said the Government was planning to introduce new laws this autumn that would give local authorities power to veto parental freedom to decide where and how their children are educated and give local authority officers the right of access to their homes without the authority of a court. It could also give local authority officers the right to speak to children as young as five without their parents or another adult present.